Welcome to Down On The Street, where we admire old vehicles found parked on the streets of the Island That Rust Forgot: Alameda, California. Since it's Maximum Minivan Day, I knew I had to prowl the streets of Alameda and find a first-generation Chrysler minivan for this series. Easy, right? It turned out to be the hardest DOTS search I've ever done, because I've tuned out minivans from my personal Cool Vehicle Detectors the way treasure hunters adjust their metal detectors to tune out bottlecaps; I just don't see them. Not that I'm anti-minivan, mind you- if every SUV owner whose lifestyle would be better served by a minivan… well, no need to go there, eh? Anyway, I figured I needed to find a Mopar minivan with some character, and that means we're looking at an example of the very last year of the first-gen Dodge Caravan today. You think an 18-year-old minivan doesn't qualify for this series? Sure, I could have shot any number of mid-80s examples, but come on- look at the patina! 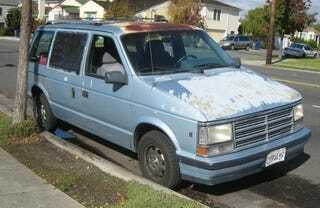 This van has been taking a beating ever since Saddam Hussein crossed the line in the sand. Also, it's clearly a parts runner for the primered Hell Project Alfa in the driveway. One of the side windows is a duct-tape/garbage bag combo, and some of the other windows are left open 24/7, rain or shine. You could get a 100-horse 2.5 inline four in '90, but the emblems on this one indicate that the Mitsubishi 3.0 or 3.5 liter V6 (packing 142 or 150 horsepower, respectively) motivates this Alfa-parts-haulin' machine. And, yes, that's an early-60s Impala in the driveway next door.